Yesterday, a new anti-piracy law went live in Sweden. The result was an immediate 30% drop in Sweden’s Internet traffic. Above: Traffic data from the Swedish IXP Netnod. Note the significant traffic drop on April 1 (marked by the red arrow). The combined traffic passing through Sweden’s Internet Exchange Points usually peaks around 160 Gbit/s, but on Wednesday it peaked at around 110 Gbit/s. That’s a huge drop in traffic, and is presumably a direct result of less file sharing taking place. Were people hoarding files the day before? Another interesting observation is that there was more traffic than usual during the last days before the law took effect. Were people hoarding films and music? 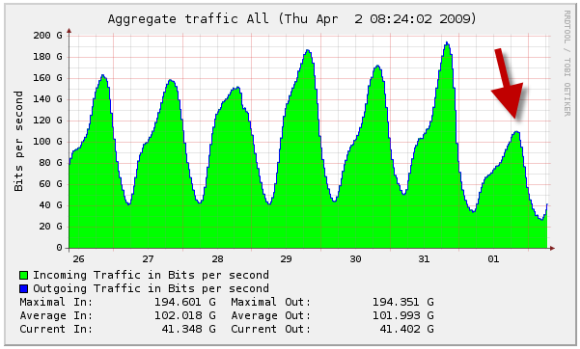 On Tuesday (the day before the law went live) traffic peaked at nearly 200 GBit/s, roughly 25% above normal levels. We’d like to point out that although the Swedish IPRED law went live on April 1, it’s NOT an April Fool’s joke. It’s been a hotly debated subject here in Sweden (where Pingdom is based) for quite some time. The new changes to Swedish law that are collectively referred to as “the IPRED law” make it significantly easier for industry organizations (for example those representing the film and music industry) to prosecute individuals involved in illegal file sharing and piracy. Now that the law is live, it is expected that these organizations will immediately begin to “hunt down” individuals involved in illegal file sharing to a much greater extent than before. A survey performed by SIFO Research International in March 2009 found that 69% of the Swedish people were against the IPRED law. Temporary result or permanent change? The question is if this traffic drop is just a temporary result or a permanent change. It’s possible that people will start testing the waters after a while to see what they can get away with, or that people simply will start using other methods of file sharing that are more difficult to trace. Time will tell. Yeah, I know… it’s stupid to compare percentage like that because the numbers don’t apply, but it would be nice to see if people went out and bought _more_ media than usually. @Eifrem: That will indeed be very interesting to see. Will CD and DVD sales increase now? I very much doubt sales will increase. The majority stuff I download I would either just wait for to appear on TV, or just not bother watching it if I couldn’t download it. Any trend after 12 days? Also will the take up of faster internet services now slow? this could actually be bad for ISP’s. It just goes to show that the internet essentially is divided into a very large group who wont pay for products and services and a group who will. A 30% drop is not so bad, imagine it was the other way around.